American singer Aaliyah released three studio albums, two compilation albums, and 26 singles. She was born in Brooklyn, New York, and was raised in Detroit, Michigan. At age 10, she appeared on Star Search and performed in concert alongside Gladys Knight. At age 12, Aaliyah was signed to Jive Records and Blackground Records by her uncle, Barry Hankerson. He introduced her to R. Kelly, who became her mentor, as well as lead songwriter and producer of her debut album. Age Ain't Nothing but a Number sold three million copies in the United States and was certified double Platinum by the Recording Industry Association of America (RIAA). After facing allegations of an illegal marriage with Kelly, Aaliyah ended her contract with Jive and signed to Atlantic Records. During her short career, Aaliyah earned 12 top 40 singles in the U.S. as well as 17 top 40 singles in the UK. Aaliyah worked with record producers Timbaland and Missy Elliott for her second album, One in a Million, which sold three million copies in the United States and over eight million copies worldwide. In 2000, Aaliyah appeared in her first major film, Romeo Must Die. She also contributed to the film's soundtrack, where "Try Again" was released as a single. The song topped the Billboard Hot 100 solely on radio airplay, making Aaliyah the first artist in Billboard history to achieve this feat. "Try Again" earned Aaliyah a Grammy Award nomination for Best Female R&B Vocalist. After completing Romeo Must Die, Aaliyah filmed her part in Queen of the Damned. She released her third and final album, Aaliyah, in July 2001. On August 25, 2001, Aaliyah and eight others were killed in a plane crash in The Bahamas after filming the music video for the single "Rock the Boat". The pilot, Luis Morales III, was unlicensed at the time of the accident and had traces of cocaine and alcohol in his system. Aaliyah's family later filed a wrongful death lawsuit against Blackhawk International Airways, which was settled out of court. Since then, Aaliyah has achieved commercial success with several posthumous releases. As of December 2008, she has sold 8.1 million albums in the United States and an estimated 24 to 32 million albums worldwide. A bonus DVD with some editions of the 2001 Aaliyah album. Includes four music videos and a behind-the-scenes documentary. A bonus DVD with the special edition of the I Care 4 U album which includes nine music videos, the same behind-the-scenes video from the 2001 DVD, and the Japananimation commercial to promote the Aaliyah album, also the European edition includes the "Miss You" music video. June 27, 2006 (US) 60-minute documentary; includes rare behind the scenes footage, promo video clips and interviews with Aaliyah, Missy Elliott, P. Diddy, Damon Dash and Timbaland. "One in a Million (Remix)"
A ^ "Are You Ready" did not enter the Hot R&B/Hip-Hop Songs chart, but peaked at number 42 on the Hot R&B/Hip-Hop Airplay chart. B ^ ^ "One in a Million" did not enter the Billboard Hot 100, but peaked at number 25 on the Hot 100 Airplay chart. It did not enter the Hot R&B/Hip-Hop Songs chart, but peaked at number 1 on the Hot R&B/Hip-Hop Airplay chart. C ^ ^ "4 Page Letter" did not enter the Billboard Hot 100, but peaked at number 55 on the Hot 100 Airplay chart. It did not enter the Hot R&B/Hip-Hop Songs chart, but peaked at number 12 on the Hot R&B/Hip-Hop Airplay chart. D ^ ^ "Hot Like Fire" and "The One I Gave My Heart To" charted as a double A-side single in the United Kingdom. E ^ "Hot Like Fire" did not enter the Hot R&B/Hip-Hop Songs chart, but peaked at number 31 on the Hot R&B/Hip-Hop Airplay chart. F ^ "Come Back in One Piece" did not enter the Billboard Hot 100, but peaked at number 17 on the Bubbling Under Hot 100 Singles chart, which acts as a 25-song extension to the Hot 100. G ^ "I Need You Tonight" did not enter the Billboard Hot 100, but peaked at number 3 on the Bubbling Under Hot 100 Singles chart, which acts as a 25-song extension to the Hot 100. H ^ "Final Warning" did not enter the Hot R&B/Hip-Hop Songs chart, but peaked at number 23 on the Bubbling Under R&B/Hip-Hop Singles chart, which acts as a 25-song extension to the Hot R&B/Hip-Hop Songs chart. I ^ "You Won't See Me Tonight" did not enter the Billboard Hot 100, but peaked at number 21 on the Bubbling Under Hot 100 Singles chart, which acts as a 25-song extension to the Hot 100. J ^ "I Can Be" did not enter the Hot R&B/Hip-Hop Songs chart, but peaked at number 2 on the Bubbling Under R&B/Hip-Hop Singles chart, which acts as a 25-song extension to the Hot R&B/Hip-Hop Songs chart. K ^ "Where Could He Be" did not enter the Hot R&B/Hip-Hop Songs chart, but peaked at number 20 on the Bubbling Under R&B/Hip-Hop Singles chart, which acts as a 25-song extension to the Hot R&B/Hip-Hop Songs chart. ^ a b Huey, Steve. "Aaliyah > Biography". Allmusic. Retrieved June 7, 2009. ^ a b "Aaliyah". The Daily Telegraph. Telegraph Media Group. November 22, 2001. Retrieved June 7, 2009. ^ Dansby, Andrew (August 27, 2001). "Aaliyah Dies in Plane Crash". Rolling Stone. Wenner Media. Archived from the original on 23 June 2009. Retrieved June 7, 2009. ^ a b c d e f g h "RIAA – Gold & Platinum". Recording Industry Association of America. Retrieved June 14, 2016. ^ Perrone, Pierre (August 27, 2001). "Aaliyah – Obituaries, News". The Independent. Independent News & Media. Archived from the original on June 6, 2010. Retrieved June 7, 2009. ^ Wolk, Josh (March 26, 2000). "'Romeo' and Julia". Entertainment Weekly. Time. Retrieved June 28, 2009. ^ Pareles, Jon (August 27, 2001). "Aaliyah, 22, Singer Who First Hit the Charts at 14". The New York Times. The New York Times Company. Retrieved June 28, 2009. ^ "Chart Beat Bonus". Billboard. Nielsen Business Media. August 31, 2001. Archived from the original on 2 August 2009. Retrieved July 23, 2009. ^ "R&B's Aaliyah dies in plane crash". BBC News. August 26, 2001. Archived from the original on 23 June 2009. Retrieved June 28, 2009. ^ Schumacher-Rasmussen, Eric (August 26, 2001). "Aaliyah Killed In Plane Crash". MTV News. Archived from the original on 18 April 2009. Retrieved April 9, 2009. ^ "U.S. investigators to probe Aaliyah crash". CNN. August 27, 2001. Archived from the original on 13 April 2009. Retrieved April 8, 2009. ^ Holguin, Jaime (November 11, 2003). "Aaliyah Crash Pilot Was On Cocaine". CBS News. Retrieved June 28, 2009. ^ Silverman, Stephen M. (August 26, 2002). "Aaliyah Remembered One Year Later". People. Time. Retrieved April 4, 2009. ^ Caulfield, Keith (December 12, 2008). "Ask Billboard: 'Titanic,' Mid-'90s Singers, Tori Amos". Billboard. Nielsen Business Media. Archived from the original on January 14, 2009. Retrieved April 14, 2009. All except I Care 4 U: "Aaliyah Album & Song Chart History: Billboard 200". Billboard. Prometheus Global Media. Retrieved September 20, 2012. I Care 4 U: "Aaliyah > Awards". AllMusic. Rovi Corporation. Retrieved September 20, 2012. All except I Care 4 U: "Aaliyah Album & Song Chart History: R&B/Hip-Hop Albums". Billboard. Prometheus Global Media. Retrieved September 20, 2012. Top 50 peaks: "Discography Aaliyah". australian-charts.com. Hung Medien. Retrieved September 20, 2012. Top 100 peaks until December 2010: Ryan, Gavin (2011). 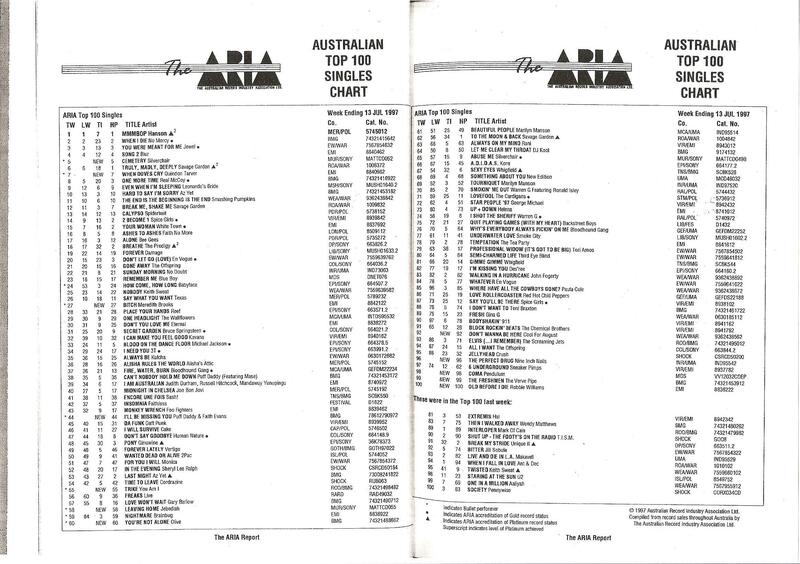 Australia's Music Charts 1988-2010. Mt. Martha, VIC, Australia: Moonlight Publishing. 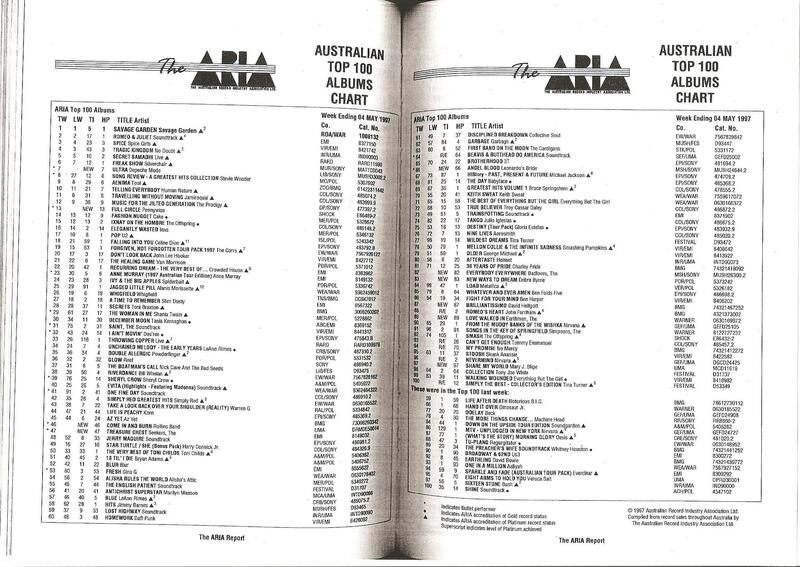 "Back & Forth": "The ARIA Australian Top 100 Singles Chart - Week Ending 16 Oct 1994". ARIA. Retrieved February 11, 2016. 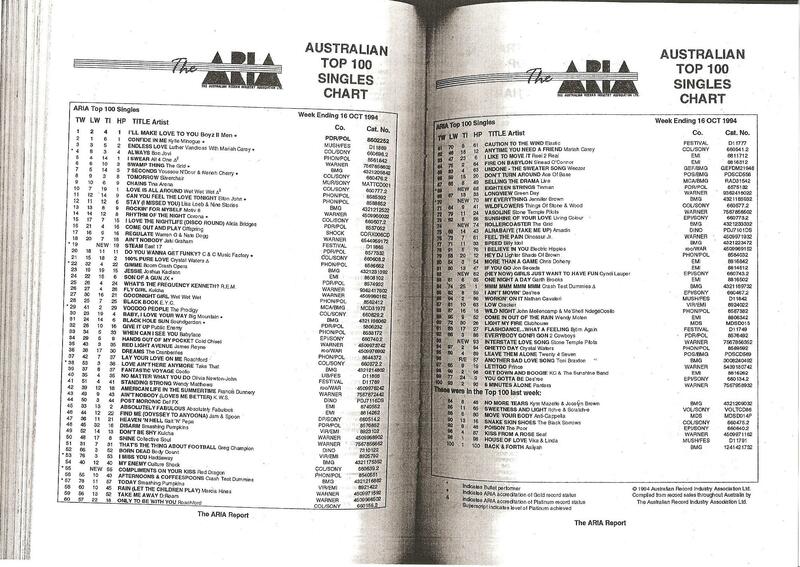 "One in a Million": "The ARIA Australian Top 100 Singles Chart - Week Ending 13 Jul 1997". ARIA. Retrieved February 11, 2016. One in a Million: "The ARIA Australian Top 100 Albums Chart - Week Ending 04 May 1997". ARIA. Retrieved February 11, 2016. Ultimate Aaliyah: "The ARIA Report: Issue 795 (Week Commencing 23 May 2005)" (PDF). Australian Recording Industry Association. p. 6. Retrieved September 20, 2012. Age Ain't Nothing but a Number: "Top Albums/CDs – Volume 60, No. 5, August 22, 1994". RPM. Walt Grealis. Archived from the original on January 15, 2016. Retrieved September 20, 2012. One in a Million: "Top Albums/CDs – Volume 64, No. 5, September 16, 1996". RPM. Walt Grealis. Archived from the original on January 15, 2016. Retrieved September 20, 2012. Aaliyah: "Aaliyah Album & Song Chart History: Canadian Albums". Billboard. Prometheus Global Media. Retrieved September 20, 2012. ^ a b "Chartverfolgung / Aaliyah / Longplay". musicline.de (in German). Media Control Charts. Archived from the original on 2013-12-19. Retrieved September 20, 2012. ^ a b c "Discografie Aaliyah". dutchcharts.nl (in Dutch). Hung Medien. Retrieved September 20, 2012. ^ a b c "Discography Aaliyah". charts.org.nz. Hung Medien. Archived from the original on October 24, 2012. Retrieved September 20, 2012. ^ a b c "Discography Aaliyah". swedishcharts.com. Hung Medien. Retrieved September 20, 2012. ^ a b c "Aaliyah (Charts)" (select "Charts" tab). hitparade.ch (in German). Hung Medien. Retrieved September 20, 2012. ^ a b c "Aaliyah". Official Charts Company. Retrieved September 20, 2012. ^ Erlewine, Stephen Thomas. "Age Ain't Nothing But a Number – Aaliyah > Overview". AllMusic. Rovi Corporation. Retrieved September 20, 2012. ^ "REVOLT - Age Still Ain't Nothing But A Number: Aaliyah's Debut Turns 20". 17 April 2015. Archived from the original on 17 April 2015. ^ "What Millennials Should Know About… Aaliyah's 'Age Ain't Nothing But A Number' LP". 26 August 2014. ^ Lambe, Stacy (1 June 2015). "20 Years Later: 10 Important Numbers In Aaliyah's Life | VH1 Music News". VH1. Archived from the original on June 1, 2015. Retrieved 31 December 2016. ^ a b "Aaliyah Returns To Music". Billboard. Retrieved December 18, 2018. ^ a b c d e "Certified Awards" (enter "Aaliyah" into the "Keywords" box, then select "Search"). British Phonographic Industry. Retrieved September 20, 2012. 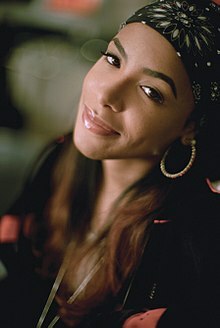 ^ a b c "Gold and Platinum Search (Aaliyah)". Music Canada. Retrieved September 20, 2012. ^ Stanley, Leo. "One in a Million – Aaliyah > Overview". AllMusic. Rovi Corporation. Retrieved September 20, 2012. ^ "Aaliyah Died 10 Years Ago Today: What Fans Say". ^ Erlewine, Stephen Thomas. "Aaliyah – Aaliyah > Overview". AllMusic. Rovi Corporation. Retrieved September 20, 2012. ^ "NME News Drake unveils new Aaliyah duet 'Enough Said' – listen". NME. ^ Ayers, Mike; Prince, David J.; Herrera, Monica (December 23, 2009). "The Decade in Music: Top 50 Moments". Billboard. Prometheus Global Media. Retrieved May 5, 2013. ^ "ARIA Charts – Accreditations – 2003 Albums". Australian Recording Industry Association. Archived from the original on December 21, 2012. Retrieved September 20, 2012. ^ a b "Gold-/Platin-Datenbank: Aaliyah" (in German). Bundesverband Musikindustrie. Retrieved September 20, 2012. ^ a b "The Official Swiss Charts and Music Community: Awards (Aaliyah)". swisscharts.com. Hung Medien. Retrieved September 20, 2012. ^ a b c "Discographie Aaliyah". lescharts.com (in French). Hung Medien. Retrieved September 20, 2012. ^ Bush, John. "I Care 4 U – Aaliyah > Overview". AllMusic. Rovi Corporation. Retrieved September 20, 2012. ^ "Certifications Albums Or – année 2003" (in French). Syndicat National de l'Édition Phonographique. Archived from the original on September 15, 2012. Retrieved September 20, 2012. ^ Kellman, Andy. "Ultimate Aaliyah – Aaliyah > Overview". AllMusic. Rovi Corporation. Retrieved September 20, 2012. ^ "Aaliyah Album & Song Chart History: Hot 100". Billboard. Prometheus Global Media. Retrieved September 21, 2012. ^ "Aaliyah Album & Song Chart History: R&B/Hip-Hop Songs". Billboard. Prometheus Global Media. Retrieved September 21, 2012. ^ "Discografie Aaliyah". ultratop.be (in Dutch). Hung Medien. Retrieved September 21, 2012. ^ "Chertverfolgung / Aaliyah / Single". musicline.de (in German). Media Control Charts. Archived from the original on December 19, 2013. Retrieved September 21, 2012. ^ "Top 50 Singles Chart: Chart #1148 (Sunday 28 February 1999)". Recorded Music NZ. Retrieved September 22, 2012. ^ "Goud/Platina". NVPI. Retrieved August 24, 2018. ^ "ARIA Charts – Accreditations – 2000 Singles". Australian Recording Industry Association. Retrieved September 21, 2012. ^ "Ultratop – Goud en Platina – 2000". ultratop.be. Hung Medien. Retrieved September 21, 2012. ^ "Top 50 Singles Chart: Chart #1219 (Sunday 9 July 2000)". Recording Industry Association of America. Retrieved September 22, 2012. "Live and Die for Hip Hop": "Kris Kross Album & Song Chart History: Hot 100". Billboard. Prometheus Global Media. Retrieved September 22, 2012. "Up Jumps da Boogie": "Timbaland & Magoo Album & Song Chart History: Hot 100". Billboard. Prometheus Global Media. Retrieved September 22, 2012. "Don't Think They Know": "Chris Brown Album & Song Chart History: Hot 100". Billboard. Prometheus Global Media. Retrieved July 6, 2013. "I Need You Tonight": "Junior M.A.F.I.A. Album & Song Chart History: R&B/Hip-Hop Songs". Billboard. Prometheus Global Media. Retrieved September 22, 2012. "Live and Die for Hip Hop": "Kris Kross Album & Song Chart History: R&B/Hip-Hop Songs". Billboard. Prometheus Global Media. Retrieved September 22, 2012. "Up Jumps da Boogie": "Timbaland & Magoo Album & Song Chart History: R&B/Hip-Hop Songs". Billboard. Prometheus Global Media. Retrieved September 22, 2012. "I Need You Tonight": "Junior M.A.F.I.A. > Awards". AllMusic. Rovi Corporation. Retrieved September 22, 2012. "Live and Die for Hip Hop": "Kris Kross > Awards". AllMusic. Rovi Corporation. Retrieved September 22, 2012. "Up Jumps da Boogie": "Timbaland > Awards". AllMusic. Rovi Corporation. Retrieved September 22, 2012. ^ "Discography Kris Kross". charts.org.nz. Hung Medien. Retrieved September 22, 2012. ^ "Aaliyah" (select "Singles" tab). The Official Charts Company. Retrieved September 20, 2012. ^ "Gold & Platinum: Timbaland". Recording Industry Association of America. Retrieved September 22, 2012. ^ "Gold & Platinum: Chris Brown". Recording Industry Association of America. Retrieved April 26, 2018. ^ "Nas Album & Song Chart History: R&B/Hip-Hop Songs". Billboard. Prometheus Global Media. Retrieved September 22, 2012. ^ Kellman, Andy. "Remix City, Vol. 1 – R. Kelly > Overview". AllMusic. Rovi Corporation. Retrieved September 22, 2012. ^ Stanley, Leo. "Sprung [Original Soundtrack] – Original Soundtrack > Overview". AllMusic. Rovi Corporation. Retrieved September 22, 2012. ^ Huey, Steve. "Supa Dupa Fly – Missy Elliott > Overview". AllMusic. Rovi Corporation. Retrieved September 22, 2012. ^ a b Stanley, Leo. "Welcome to Our World – Timbaland & Magoo > Overview". AllMusic. Rovi Corporation. Retrieved September 22, 2012. ^ Stanley, Leo. "Cheers 2 U – Playa > Overview". AllMusic. Rovi Corporation. Retrieved September 22, 2012. ^ Bush, John. "Tim's Bio – Timbaland > Overview". AllMusic. Rovi Corporation. Retrieved September 22, 2012. ^ Erlewine, Stephen Thomas. "100% Ginuwine – Ginuwine > Overview". AllMusic. Rovi Corporation. Retrieved September 22, 2012. ^ DiBella, M.F. "I Am...The Autobiography – Nas > Overview". AllMusic. Rovi Corporation. Retrieved September 22, 2012. ^ Farley, Keith. "Da Real World – Missy Elliott > Overview". AllMusic. Rovi Corporation. Retrieved September 22, 2012. ^ Ruhlmann, William. "Music of the Heart – Original Soundtrack > Overview". AllMusic. Rovi Corporation. Retrieved September 22, 2012. ^ Bush, John. "Indecent Proposal – Timbaland & Magoo > Overview". AllMusic. Rovi Corporation. Retrieved September 22, 2012. ^ "Memoirs of a R&B Thug – Digital Black > Overview". AllMusic. Rovi Corporation. Retrieved September 22, 2012. ^ "Rick Ross – Ashes to Ashes". HipHopDX. Cheri Media Group. December 24, 2010. Retrieved July 8, 2013. ^ "Hot R&B/Hip-Hop Airplay – Issue Date: 1996-05-18". Billboard. Prometheus Global Media. Retrieved September 22, 2012. ^ "Hot 100 Airplay – Issue Date: 1997-03-22". Billboard. Prometheus Global Media. Retrieved September 22, 2012. ^ "Hot R&B/Hip-Hop Airplay – Issue Date: 1997-01-04". Billboard. Prometheus Global Media. Retrieved September 22, 2012. ^ "Hot 100 Airplay – Issue Date: 1997-05-03". Billboard. Prometheus Global Media. Retrieved September 22, 2012. ^ "Hot R&B/Hip-Hop Airplay – Issue Date: 1997-04-13". Billboard. Prometheus Global Media. Retrieved September 22, 2012. ^ "Hot R&B/Hip-Hop Airplay – Issue Date: 1997-08-16". Billboard. Prometheus Global Media. Retrieved September 22, 2012. ^ "Bubbling Under Hot 100 – Issue Date: 2000-07-15". Billboard. Prometheus Global Media. Retrieved September 22, 2012. ^ "Bubbling Under Hot 100 – Issue Date: 1995-12-16". Billboard. Prometheus Global Media. Retrieved September 22, 2012. ^ "Bubbling Under R&B/Hip-Hop Songs - Issue Date: 1999-04-10". Billboard. Prometheus Global Media. Retrieved September 22, 2012. ^ "Bubbling Under Hot 100 – Issue Date: 1999-07-17". Billboard. Prometheus Global Media. Retrieved September 22, 2012. ^ "Bubbling Under R&B/Hip-Hop Songs - Issue Date: 2002-03-23". Billboard. Prometheus Global Media. Retrieved September 22, 2012. ^ "Bubbling Under R&B/Hip-Hop Songs - Issue Date: 2005-03-12". Billboard. Prometheus Global Media. Retrieved September 22, 2012. ^ a b "Mi2N.com - SHANIA, BACKSTREET, BRITNEY, EMIMEN AND JANET TOP ALL TIME SELLERS". Archived from the original on 2009-09-03. Bogdanov, Vladimir; Woodstra, Chris; Erlewine, Stephen Thomas (2002). All Music Guide to Rock. Hal Leonard Corporation. ISBN 0-87930-653-X. Eliot, Marc (2008). Song of Brooklyn: An Oral History of America's Favorite Borough. Random House. ISBN 0-7679-2014-7.